EMV chip payments are here in the US! Consumers are now using secure EMV chip cards to pay nationwide. Chip payments reduce counterfeit card fraud, enable global interoperability, and prepare for NFC mobile contactless payments. EMV Connection provides up-to-date information and educational resources from the U.S. Payments Forum and Secure Technology Alliance to assist all industry stakeholders with EMV migration. Get your EMV migration on track with tutorials and implementation guidance that take advantage of global best practices. Learn from industry experts about the impact that EMV chip technology will have on the point-of-sale environment and key strategies for managing migration. Acquirers/processors need to consider the support that will be required to equip merchants with EMV-compliant POS solutions. Find educational resources, implementation guidance and best practices to help with EMV migration for your ATMs. U.S. Payments Forum: The cross-industry body focused on the implementation of EMV chip and other new payments technologies in the U.S.
Contactless Open Payments for Transit Webinar: Learn how contactless open payments are being implemented for transit fare payment. Biometric Payment Cards: Learn about biometric payment cards that incorporate fingerprint capture, template storage, and matching on the payment card itself. 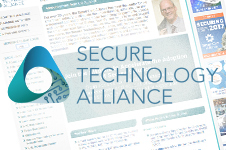 Secure Technology Alliance: Learn more about the smart card industry, technology, markets and applications.